Just another foggy day in Jensen. 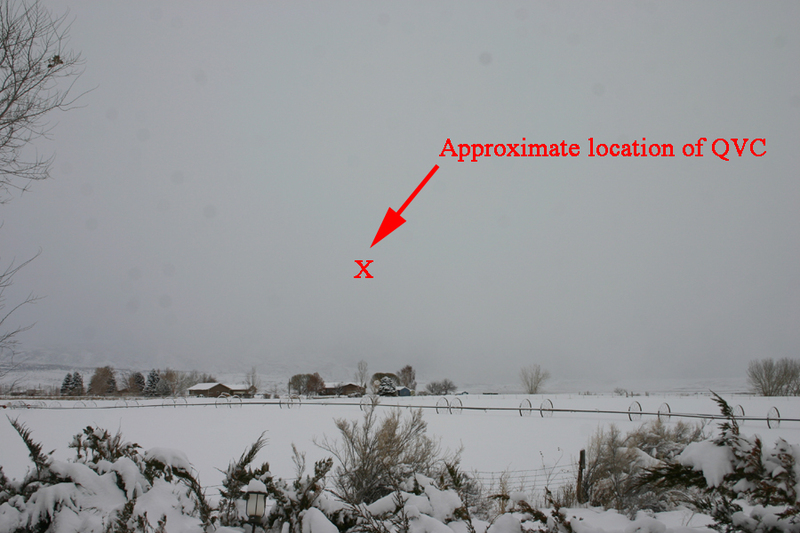 Split Mountain is somewhere out there. 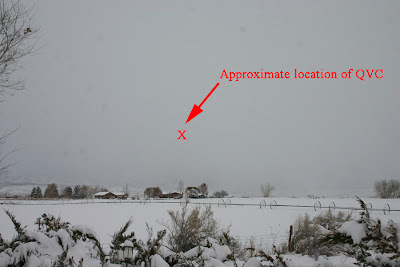 Well we were hit with another snow storm, dumping about 10 more inches of the infernal stuff and socking us in with another fog and no sun for days on end. 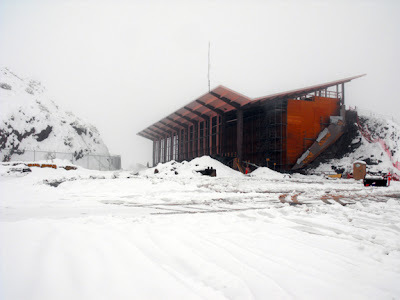 While it makes for a real pain getting out of the driveway or riding down the road, the overhanging gull-wing structure of the Quarry Visitor Center roof provides just enough protection to keep the snow out of the trench along the forms for the south wall. Just before the storm arrived the concrete was poured for the south wall. 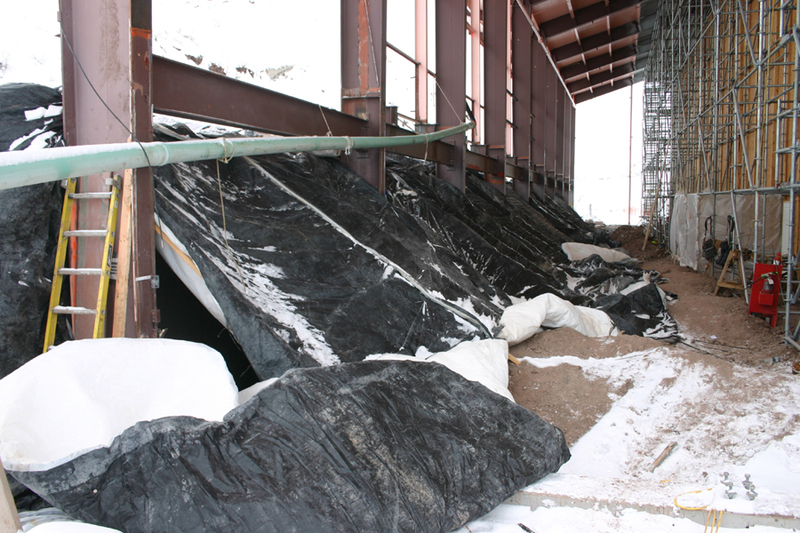 Tarps were placed over the length of the wall and propane heaters pumped hot air under the tarps. 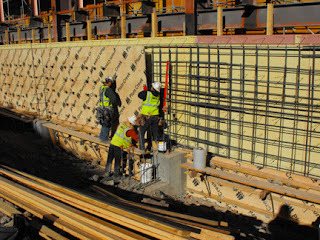 After two days the crews starting taking the forms down from around the concrete. 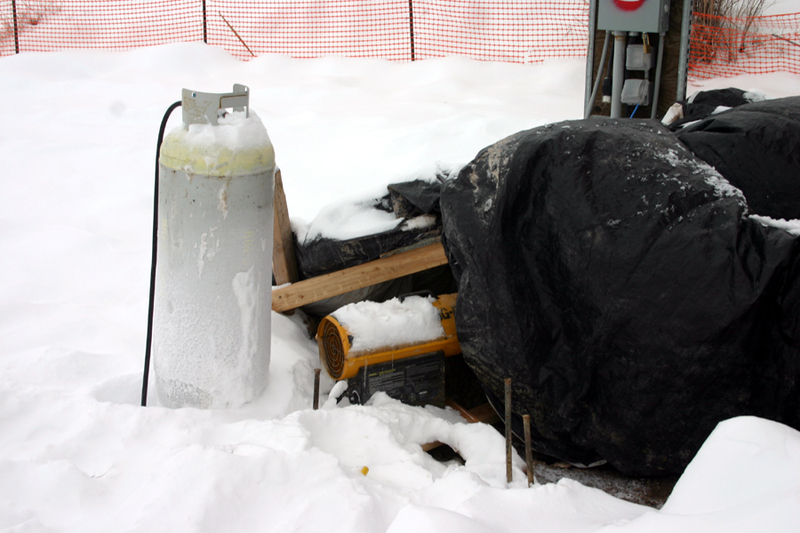 Propane tank and heater (yellow) pumping hot air under the tarp. The north side of the south wall, with forms already removed and the tarps over it. On each side of the wall three heaters are pumping warm air under the tarp. 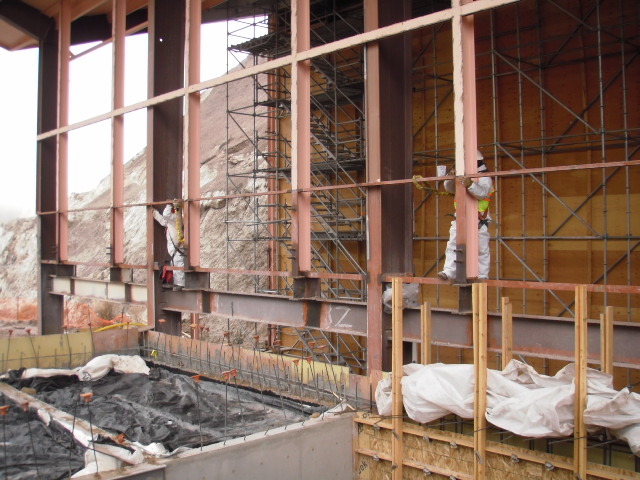 However, temperature is critical for the proper curing of the cement. At 270F concrete will freeze. Keeping the temperature above that is essential. Up into the 40s would be great, but at least above freezing is the minimum. So after the forms are down the traps are left in place and six propane heaters continue to run, pumping hot air under the blankets. That will continue for several more days. 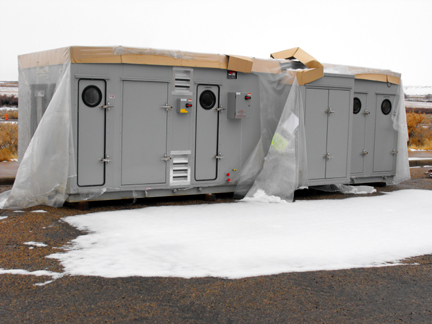 Extra tanks are stored on site to replace those that run empty. Keeping in mind the minimum temperature necessary for the concrete to cure, look at the thermometer reading at my house at 8:00 AM on December 31! Since I live only four miles from the QVC the temperatures are likely to be no better at the work site. So which will prevail, mother nature or the propane heaters? Well the evidence is in. As this photo shows Santa works very,very hard to get everywhere on Christmas Eve (no matter how remote) and the crews must have been very, very good this year (or at least since they started working on the QVC Project). What was in the stockings remains a mystery. However, rumor has it that it was neither lumps of coal, bits of rebar, nor chunks of concrete from the demolished QVC. 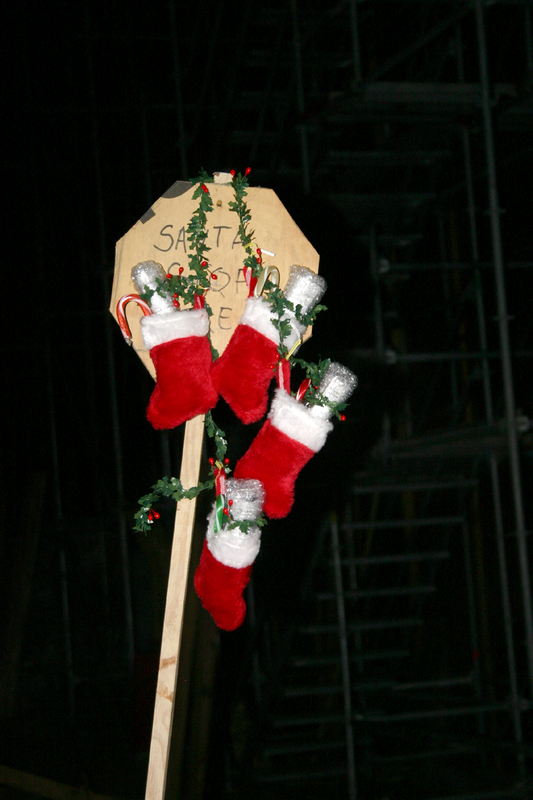 I haven't yet had a chance to check on what, if anything, Santa left under the Festivus Pole. Bulldozer In Snow: a 1950s Winter Wonderland at the Carnegie Quarry, Dinosaur National Monument. Wishing all constant readers of this blog the Happiest of Holidays! 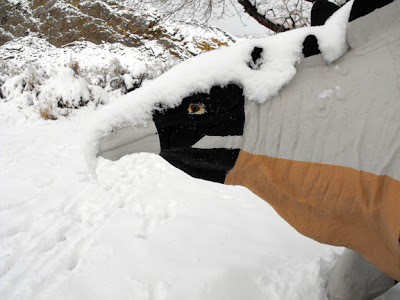 Well Winter has finally arrived at Dinosaur. First a night of freezing rain. Then a day and night of snow left a foot of the stuff on the ground. A heavy fog lays across the land. No sun has been seen for several days. And the forecast is for more of the same for the next few days. 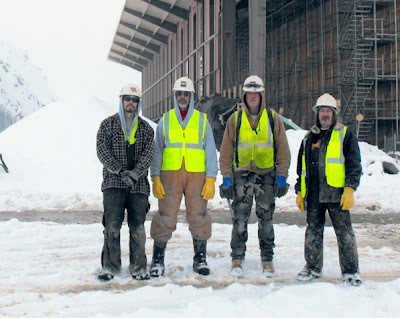 The QVC crew -- the right stuff for the white stuff. This is not too bad for those of us sitting at our computers in our warm offices. 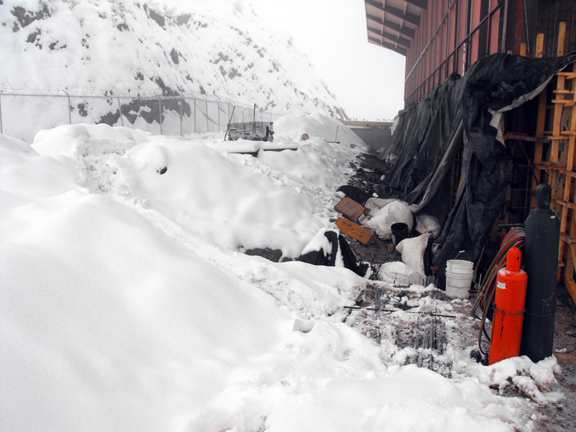 However, work must continue at the Quarry and the weather presents problems. So the crews bundle up and press on. The road to the Visitor Center is only about ¼ mile long, but it is all uphill, with some steep sections. 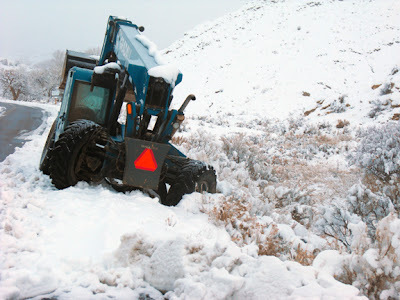 Ice and snow makes for a slippery road surface and heavy machinery can have a hard time sliding onto the sloping shoulders. The general work area and is covered by snow. Supplies under tarps need to be excavated. 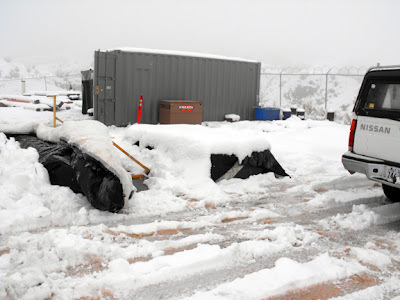 Walking around the site is difficult because even small slopes are slippery. Should it should warm up it will become a terribly muddy quagmire. 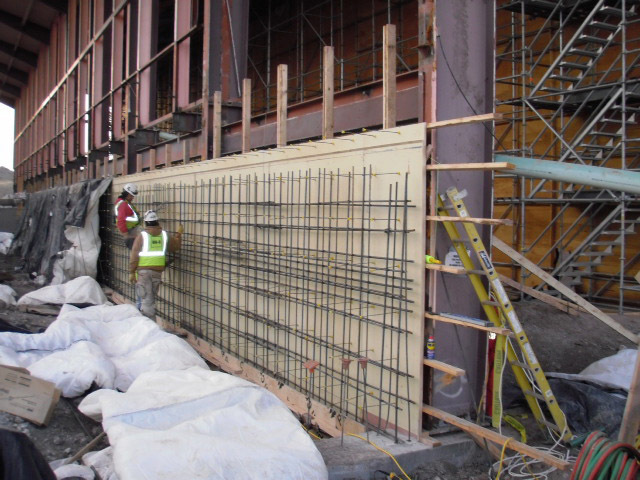 The most immediate critical concern involves concrete. The forms are nearly complete for the 150 foot long south wall. Concrete will be poured sometime next week. 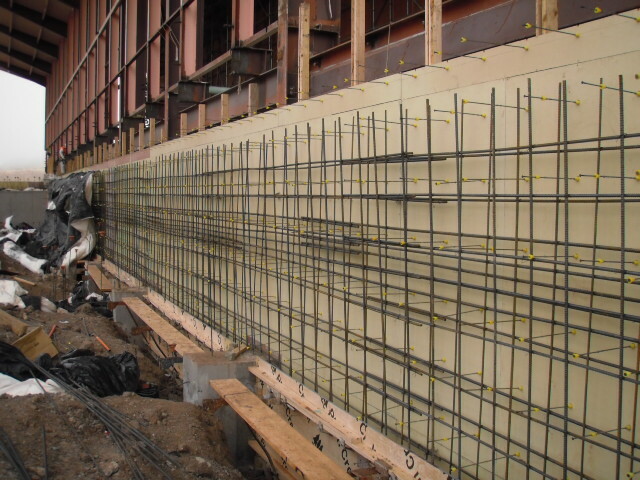 Proper curing of the concrete will take some time and is temperature sensitive. So the forms are draped under plastic. 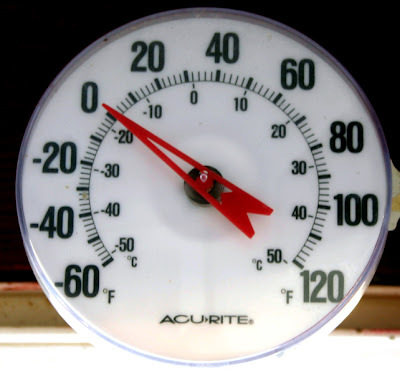 Propane heaters will keep the temperature under the plastic above the minimum temperature needed to proper curing. I’m sure glad that we don’t have to excavate fossils under these conditions. I’d rather be blogging. 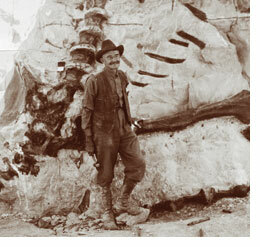 It is ironic that Earl Douglass, the paleontologist from the Carnegie Museum who found the quarry that became Dinosaur National Monument, did not, before that discovery, have much research interest in dinosaurs. His research efforts focused on Tertiary fossil mammals. In fact, he was collecting just such mammal fossils in the Uintah Basin in 1909 when the Carnegie asked him to head to the area around Jensen Utah to follow up on reports of dinosaur bones. I will speak more about Earl in future posts. Here I want to talk about his vision about the Carnegie Quarry and the American public because that ultimately led to the current construction project. Earl’s vision was striking, for nothing like this had ever been proposed before. Sure, many dinosaur bones had been taken back to museums, prepared, and put on exhibit but no one had proposed bringing the museum to the bones and exhibiting them just as they were deposited millions of years ago. That was a powerful idea that captivated many who heard it. 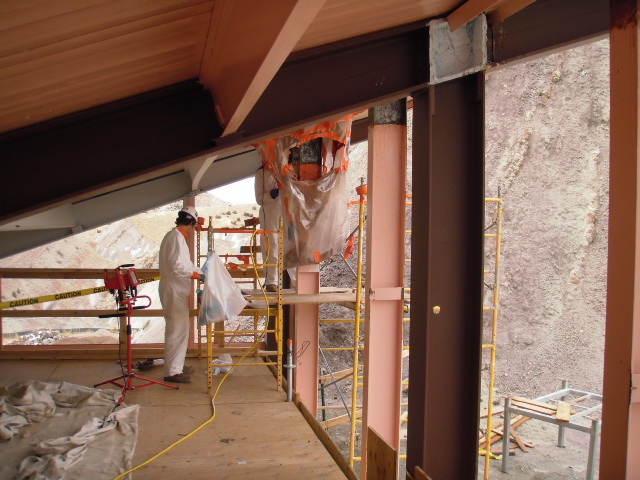 Although Dinosaur National Monument was created in 1915, bones continued to be excavated, collected, and shipped off through 1924 by the Carnegie Museum, the United States National Museum, and the University of Utah. After that the Depression, World War II, and the Korean Conflict put any development at the Monument on the back burner. Although the Quarry Visitor Center would not be built until 1957 – 1958, there were several earlier efforts to bring Douglass’s vision to reality. I will explore some of those now forgotten buildings and exhibits in upcoming posts. 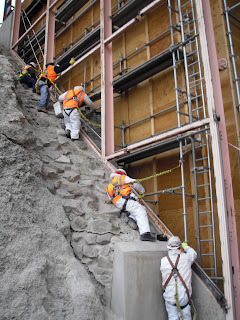 Although I haven’t reported on them in a while, construction activities continue at the Quarry Visitor Center. 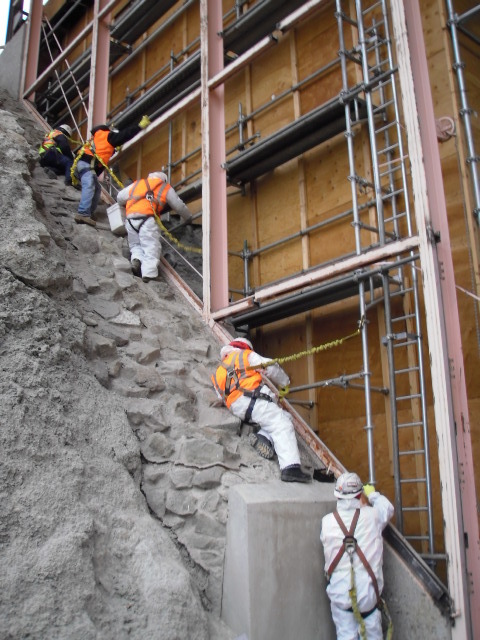 The majority of the work is still concentrated on the south wall. As I posted previously (Oct 5, 2010) the massive, vertical I-beams have been lowered and their heights adjusted so that their lower ends are all at the same height and rest on massive footers. 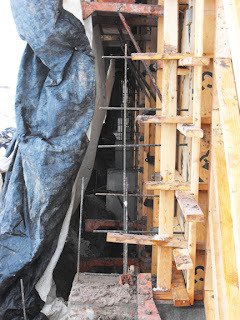 However, some of the beams are out of plumb, i.e. they do not all align from one end of the building to the other. The reasons for this are unclear, although there is a possibility that they were out of plumb when were installed in 1957. Regardless, plans are afoot to correct this problem, with several possible solutions being discussed. 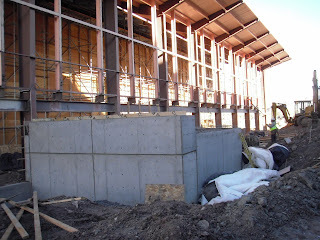 The south wall framing is being built and once the frames are completed the concrete wall can be poured. 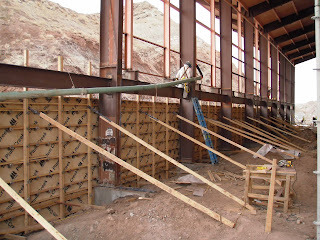 Only the lower part of the wall is solid, the upper parts will remain all glass to allow for maximum ambient light inside the building. That glass part of the wall will be installed much later. 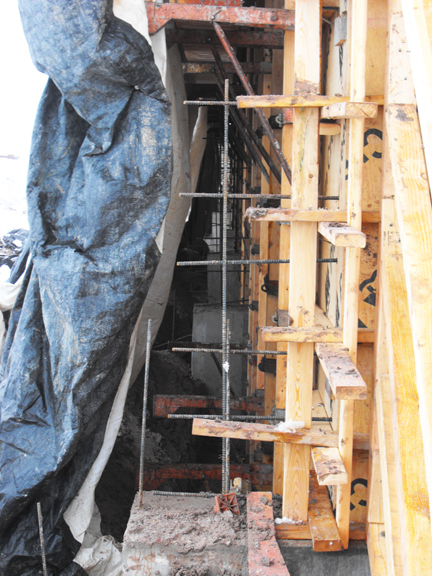 A large concrete abutment is now in place towards the west end of the south wall. This will be the support for part of the long entrance ramp that will run on the outside of the building. 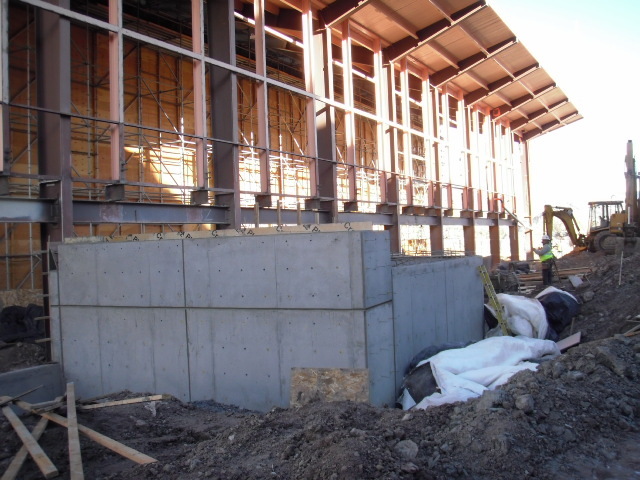 On the west side of the Visitor Center a concrete pad has been poured that will serve as base for the large heating, air circulation, and ventilation unit for the building. 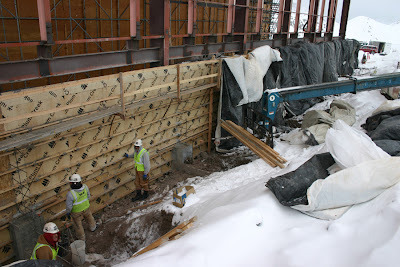 With this system there will be temperature control in the new Visitor Center. Such a system was lacking in the old building and so bays of windows were opened for cooling in the summer. That allowed vast amounts of dust to be blown into the building during the summer windstorms, as well as providing access for birds and bats to come in, roost, and crap on the fossil wall. And what would working on the QVC be without abatement? 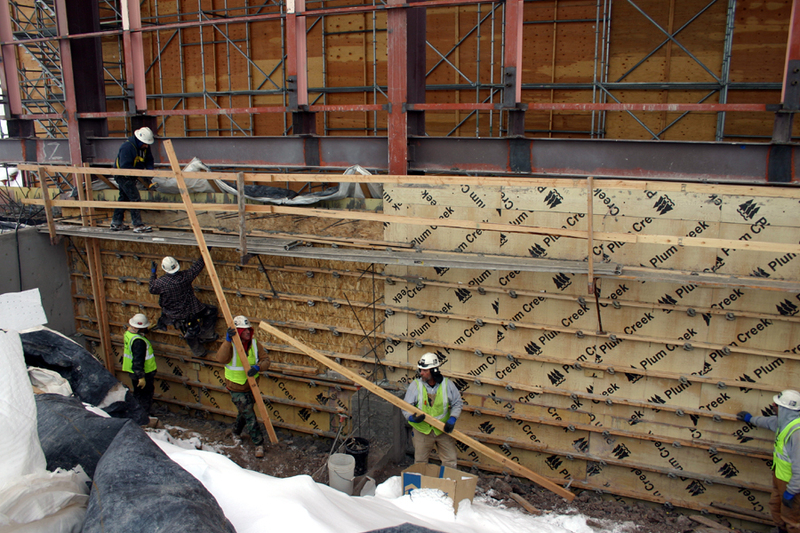 Teams have been completing abatement of the lead paint on the I-beams on all four walls of the structure. So progress continues. 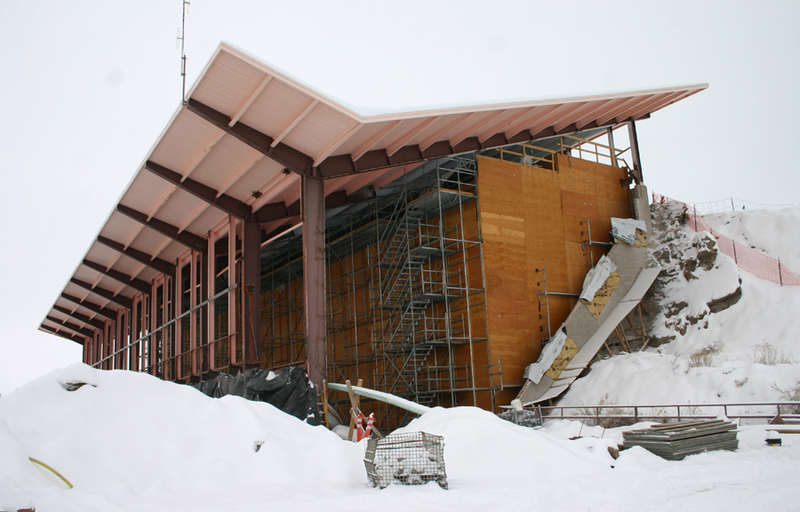 Maybe not as dramatic work as tearing down a building with heavy equipment, but still major steps towards getting the project completed next year. 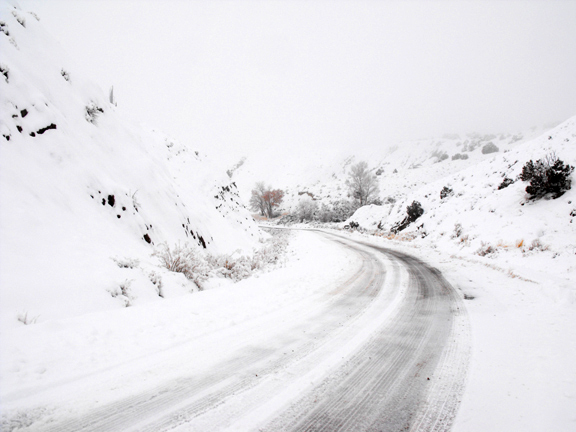 However, winter – and snow – has finally arrived. The real question now is will this winter be as cold as the last few, with temperatures well below 0oF for weeks on end? 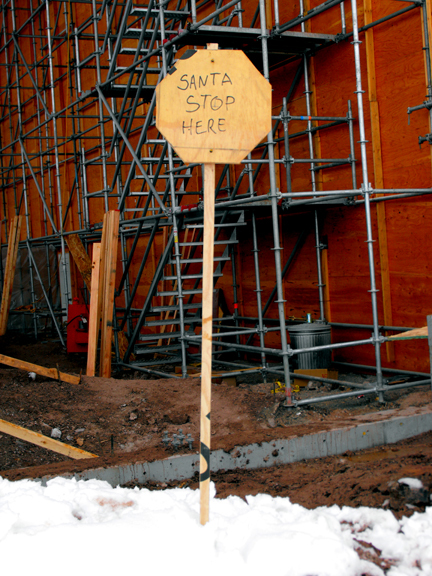 That could certainly complicate the construction situation. A variety of things have caused me to put off posting here for a while. They couldn't be avoided. Nevertheless, its time to get this train back on the tracks. So let’s start with a story of fossil discovery remarkable even for a place like Dinosaur National Monument which has provided paleontologists with so many remarkable discoveries. Dinosaurs are the most spectacular fossil to come out of the Monument, but by no means the only fossils. There were many other denizens of the Morrison ecosystem and they also generously contributed their remains, large and small, to the fossil record. Among the most amazing of these is that of a dwarf crocodilian Hoplosuchus kayi. Hoplosuchus, the seven inch terror, on exhibit at the Carnegie Museum. When speaking of crocodilians, almost everyone thinks of the big brutes, like the man killing salt water crocs of Australia. Throughout most of their history there have been croc species filling the role of large fresh water predator, but that is not how the group began. The earliest crocs, such as Protosuchus, are smallish, terrestrial animals with long slender limbs held upright beneath their armored bodies. They were probably capable of running and, given their small size, fed on insects and other small invertebrates and vertebrates. While there are no such crocs in the modern world, there were a number of them throughout the Mesozoic and one lived in what is now Dinosaur National Monument. “Pop” (J. LeRoy) Kay is an interesting individual. Originally a resident of the Uintah Basin he joined Earl Douglass in the excavations at the Carnegie Quarry. 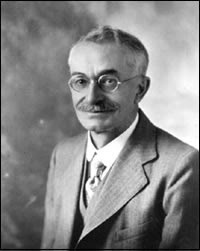 After those excavations ended in the early 1920s he migrated eastward to the Carnegie Museum and became Curator of Paleontology. From the 1930s through the 1950s he was involved in the study of Eocene and Oligocene vertebrates. Back in 1917, while working at the Carnegie Quarry, Pop’s brother-in-law, Jesse York (just10 years of age), visited and was eager to help with the building a trail down from the excavations. As one might guess, his help was sincere but not all that helpful. Kay thought he could prevent Jesse from getting injured by sending him off on another project, drilling a blasting hole in a nearby sandstone outcrop. Kay was surprised when Jesse returned to report he had a four inch hole dug. Being a man of his word, Pop put in a small charge of powder, a blasting cap, and set it off. After the blast Pop, Jesse, and a few others began looking at the chunks of rock blown down the hillside. To everyone’s surprise, someone found a part of a small skeleton in a block. With that trail work stopped and everyone came over to search for the rest. Hours later it turned up in the rubble and fit perfectly onto the piece already in hand. Both pieces were shipped back to the fossil preparation lab at the Carnegie where they were put back together and the fossil carefully exposed. The specimen was astounding. Measuring in at a whopping 7 inches total length, it was a three dimensionally preserved small crocodile with a skull, all the armor in place, and the limbs folded up underneath it. In 1926 Gilmore (1) described the specimen, naming it Hoplosuchus kayi, the specific epithet honoring Pop Kay, although Kay was embarrassed by the honor – he thought Jesse had more to do with the discovery than anyone else. Today you can see the actual specimen on exhibit in the recently redone Jurassic Hall in the Carnegie Museum. 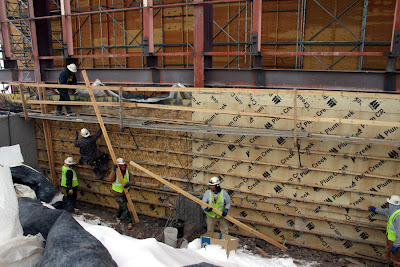 A cast replica will be in the new exhibits when the Visitor Center reopens in the Fall of 2011. 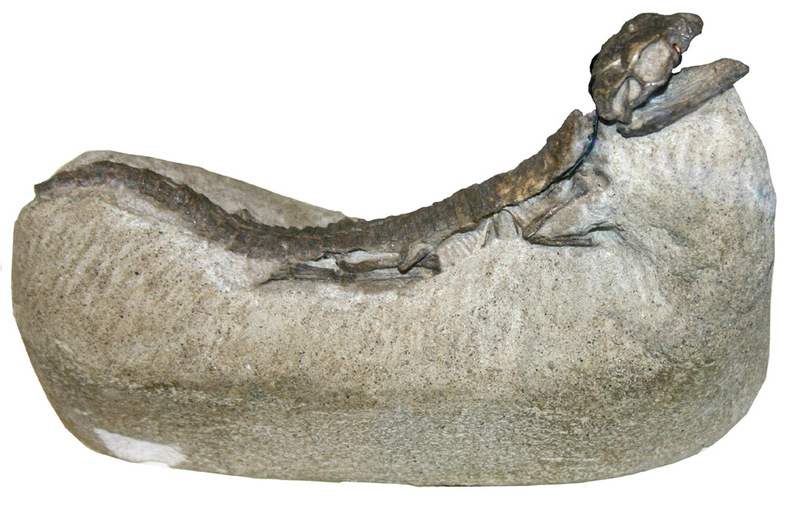 To this day, the specimen (CMNH 11361), is the only known specimen of Hoplosuchus. In all the excavations in the Morrison Formation that have been done in the following 90+ years across the western US, not another bone of this small, insect eating crocodile has turned up. In addition, it is still the best small vertebrate skeleton ever found anywhere in the Morrison. Every paleontologist would love to find a similar fossil. Not a bad discovery for a blast in a hole dug randomly by a 10 year old brother-in-law. One could not be blamed for being a bit skeptical about this tale of discovery. It has the sound of an urban legend and Gilmore did not recount it in his description of Hoplosuchus. That probably accounts for why it is so poorly known even in the paleontological community. Has it been embellished in the retelling over the years? The answer to that question is a resounding NO, because nearly four decades later, Pop Kay himself recounted the events in a short, popular article about the paleontology exhibits at the Carnegie (2). It’s a good thing he did because the story is so improbable that it is damn near unbelievable. 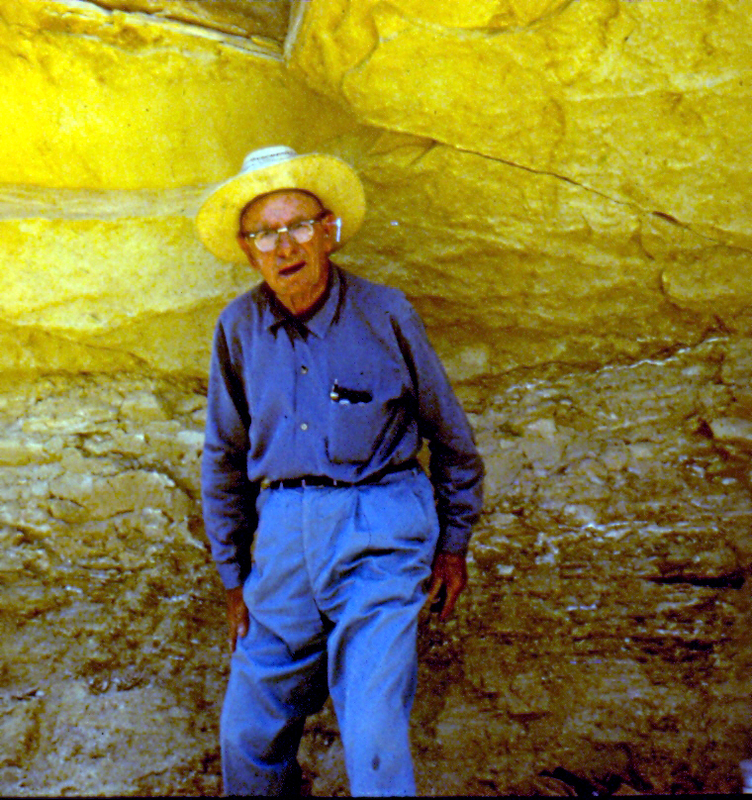 Pop Kay in 1970 at an Eocene fossil fish locality in Utah. (1) Gilmore, C.W. 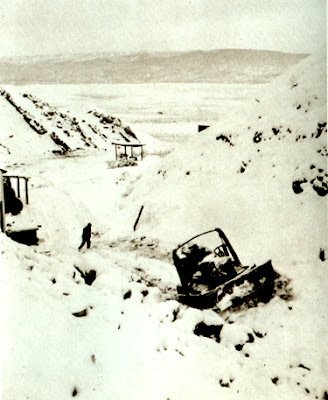 1926. A new aetosaurian reptile from the Morrison Formation of Utah. Annals of the Carnegie Museum XVI (2): 325-349. (2)Kay, J.L. 1951. More dinosaurs. Carnegie Magazine 25: 90-91, 102. Photos: Hoplosuchus: NPS.. Pop Kay: Dale Gnidovec, Orton Geological Museum, Ohio State University.